It is no secret I like parties...and baking...and babies, and when the three of these loves combine, well, I get just a wee bit excited. This might be one of my favorite baby showers yet! Usually when I pick a party theme I have a pretty good idea of how I want it to look in my head from the beginning. This safari animal theme (chosen to match the baby's nursery) was a bit different. I was drawing a blank initially, but thankfully it developed over the course of a few weeks and a few trips to the craft stores. When I'm lost, I start by picking colors. The baby's gender is a secret so we kept the colors completely gender neutral with a palette of bright green, pastel orange, and a light yellow. Next came the animals. Giraffes were an obvious choices given the color scheme and with the help of my Silhouette Cameo, I added alligators, lions, elephants, and zebras. 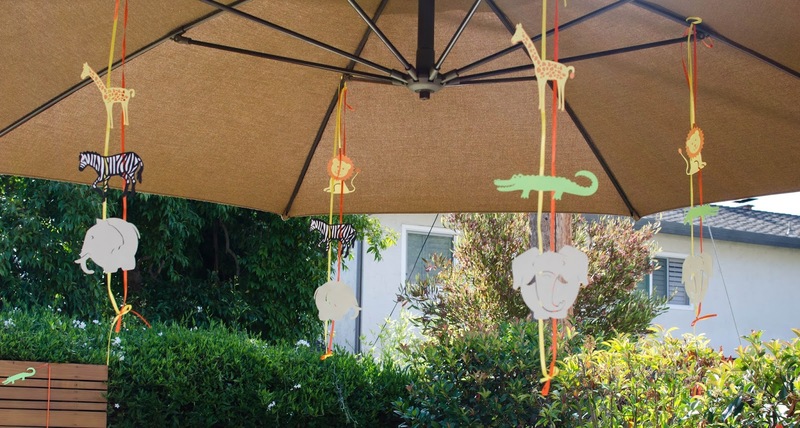 We strung two animal garlands along the doorway and the food table, and strands of three animals hung down vertically from underneath the patio umbrella. 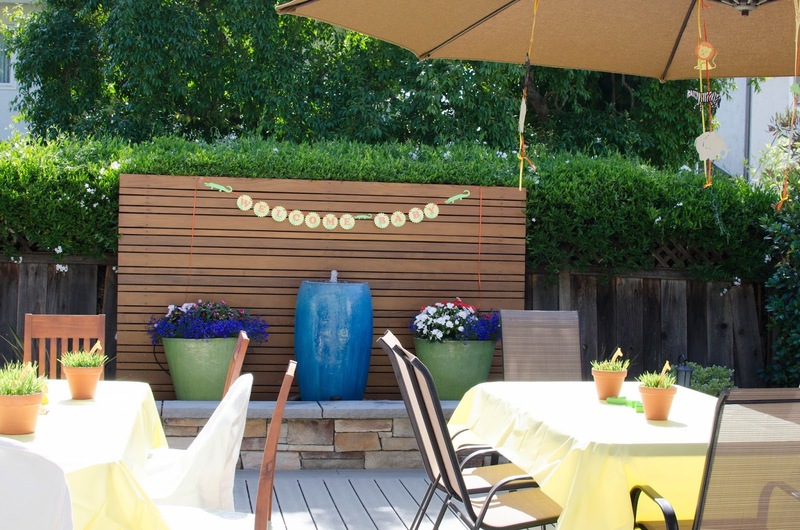 A 'welcome baby' garland decorated the patio backdrop for the outdoor portion of the party. The bits of grass coming up among the letters tied the garland in with the table centerpieces. 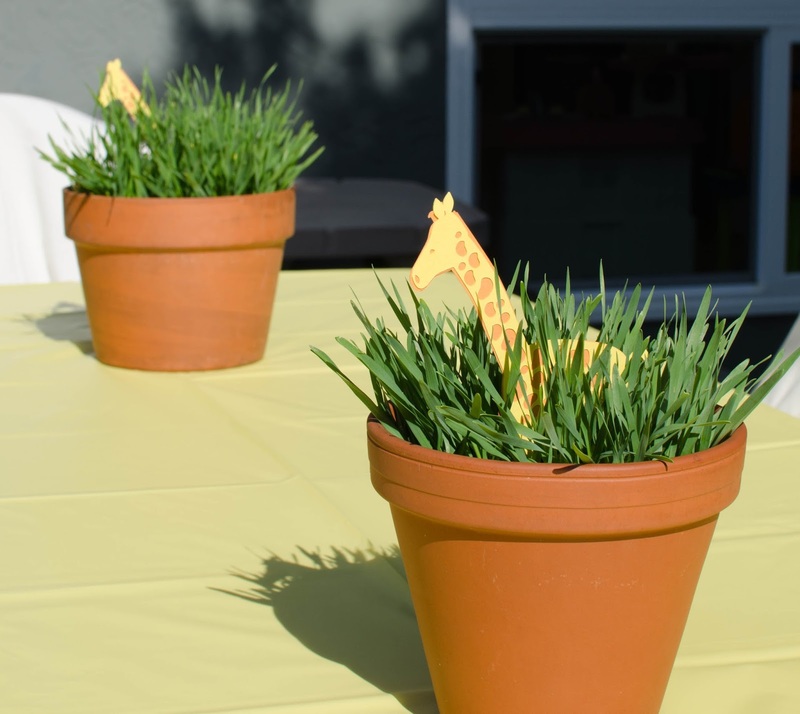 I first used wheatgrass centerpieces in my son's Very Hungry Caterpillar 1st birthday party. It is a cute, cheap, and very quick centerpiece. The seeds grow to full height in only 10 days! For the safari theme, I put giraffes peeking out among the grass. These pots and a few of my son's matching toys gave a festive look to the tables and kept the tablecloths from blowing away. 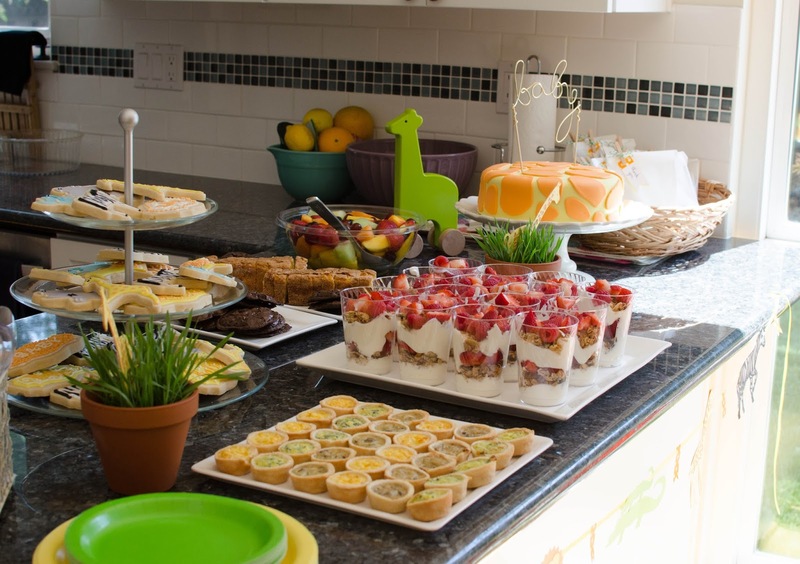 My co-hostess was in charge of the non-desserts and provided a lovely (and delicious) spread of yogurt parfaits, mini-quiche, and fruit salad - perfect for a brunch time shower. Oh, and I almost forgot to mention the delicious virgin peach bellinis! I provided the dessert selection with my go-to sugar cookies and Mexican chocolate cake. 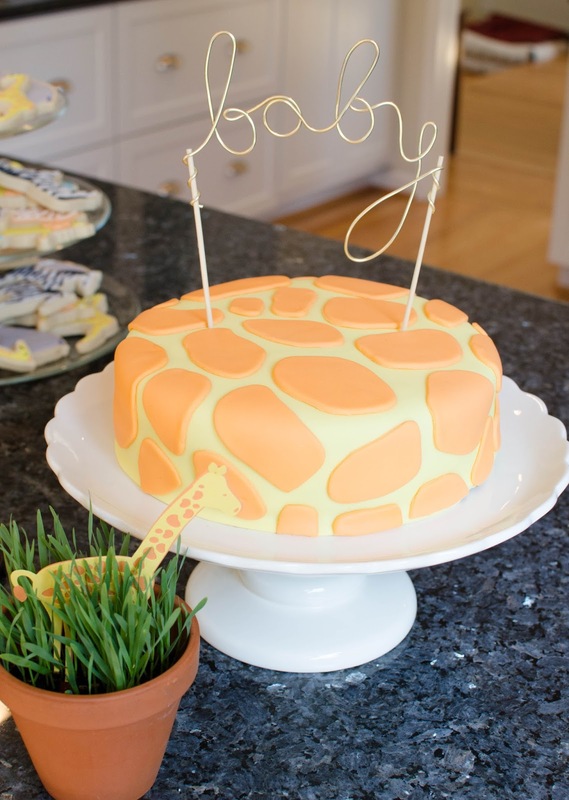 I kept the cake decorations fairly simple with a fondant giraffe print of orange shapes on top of a yellow base. And how adorably simple is this gold wire 'baby' cake topper? I loved it so much I gave it a whole separate post including a free template and the diy instructions! Despite the simple-ish cake, I went a little crazy with the sugar cookies. Sur la Table had so many cute animal cookie cutters that I practically made a zoo. We had hippos, giraffes, zebras, lions, and elephants. In fact, I made so many of these cookies that we sent them home with the guests as party favors. The animals were slipped into glassine bags and decorated with miniature clothespins, washi tape, baker's twine, and calligraphy 'thank you' tags. My favorite part of the whole party, however, had to be the group activities. Lately, I have been forgoing the typical awkward party games and instead preparing group activities or crafts. 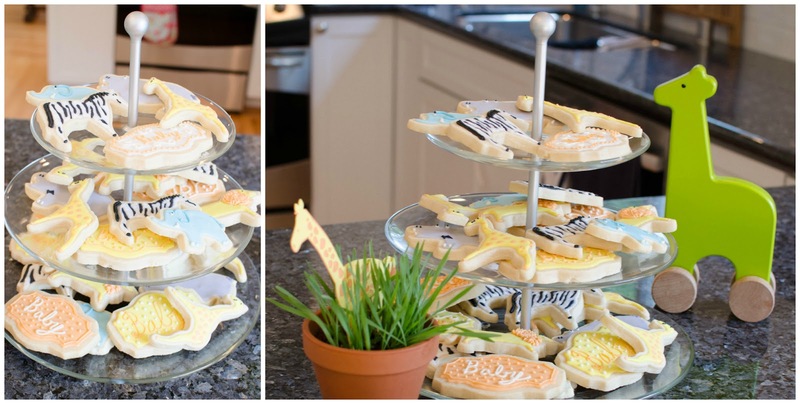 For example, my last baby shower featured cookie decorating. 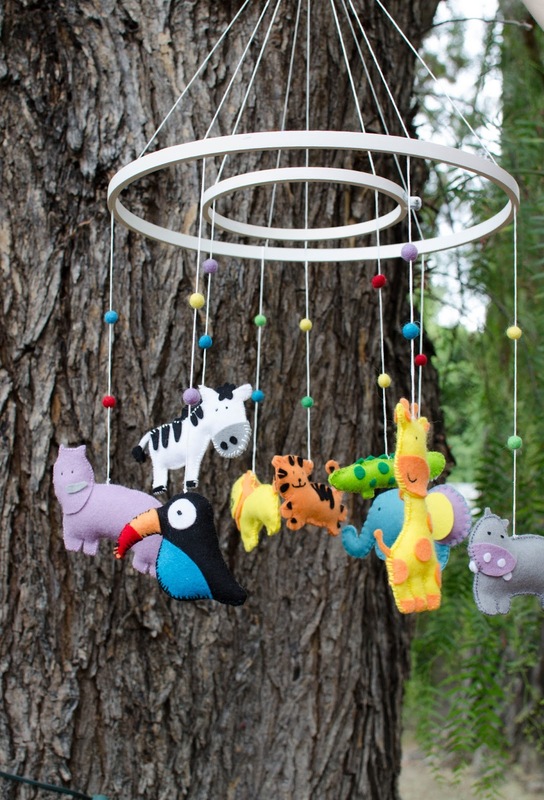 In this case, the guests helped to complete a safari animal mobile for the baby's nursery! This took a little coordination with the guest of honor in advance, but it was well worth it. 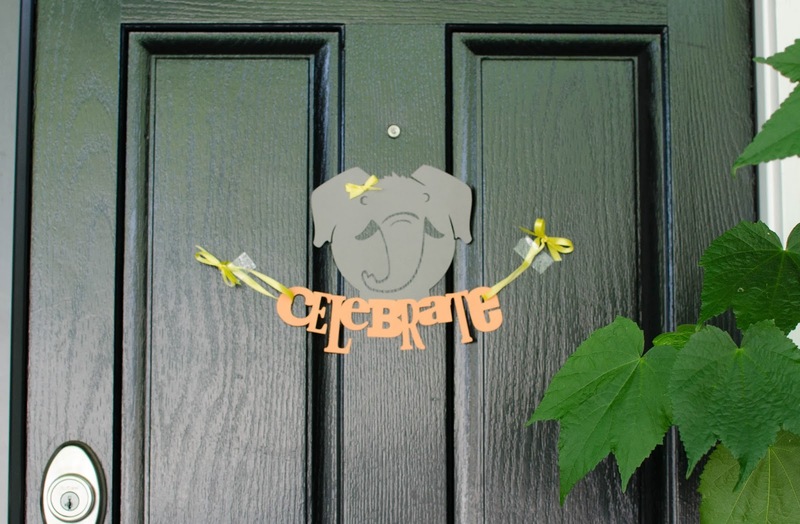 To keep the crafting simple and within the time limits of the party, I prepared packets for each animal prior to the party including the designs, pre-cut materials, and printed instructions. I can't wait to see the final product in the nursery! See the full details on this mobile and how to make your own here. 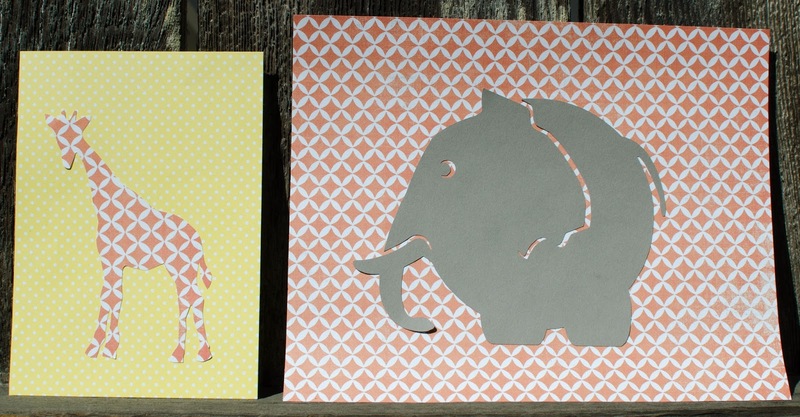 For the guests less comfortable with crafting, we had a second easier option of creating animal silhouette art with patterned paper. The guests would pick coordinating sheets of paper, cut animal silhouettes (from stencils or hand-drawn) and then glue them together. Once framed, they would make an adorable collection of art for the nursery walls. It ended up a really fun day, mostly because of the great people and the super sweet mom-to-be. We now are anxiously awaiting the arrival of the new little one! 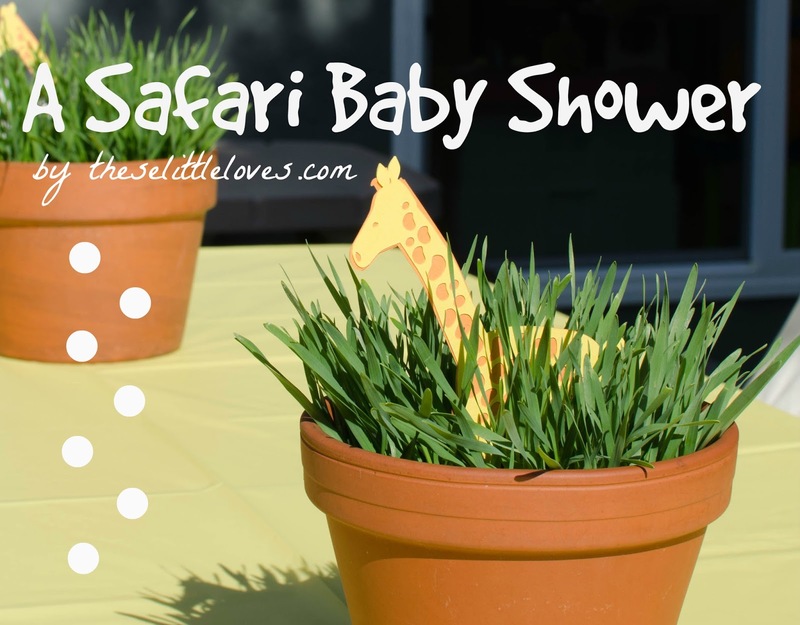 Oh my goodness, this safari baby shower is just too cute. I loved all these arrangements a lot. My nephew’s birthday is coming and I think it would be a perfect theme for his 1st birthday celebration. We will book the outdoor event venue for this party. I'm an engineer turned stay at home mom living in the beautiful San Francisco Bay Area (though always a TX girl at heart). I love all things handmade, thoughtful gift giving, picking up new skills, baking, kids, running, and I am officially addicted to Pinterest.